Cauliflower Snow Ball Brassica Oleracea is an opened pollinated vegetable plant. Cauliflower Snow Ball seeds can be sown for spring or fall harvest. For spring harvests the seeds are started indoors 1 month before the last frost and transplanted out after the last frost. For a fall harvest the seeds are planted directly outdoors after the last frost in spring. The growing Cauliflower has to be spaced 18-24 inches apart in rows 3 feet apart. Cauliflower Snow Ball that is heavy yielding, reliable, and self blanching, with heads that are 6 inches across, solid and white with a smooth curd. 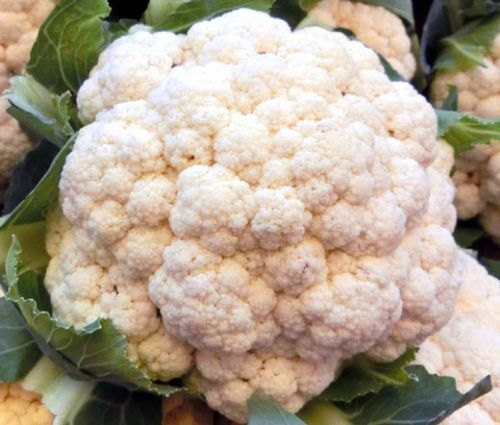 This Cauliflower is good fresh or frozen, and it is a standard main crop variety for home and market garden.